Threat and adversarial information has become easily accessible and gone mainstream in the last couple of years. However managing the threat lifecycle, can still be challenging for organizations continuously under pressure for the next attack and low on resources. Prioritizing threats, managing incidents and neutralizing the attackers successfully requires dedicated tools, processes as well as broad adoption by the IT Security staff. 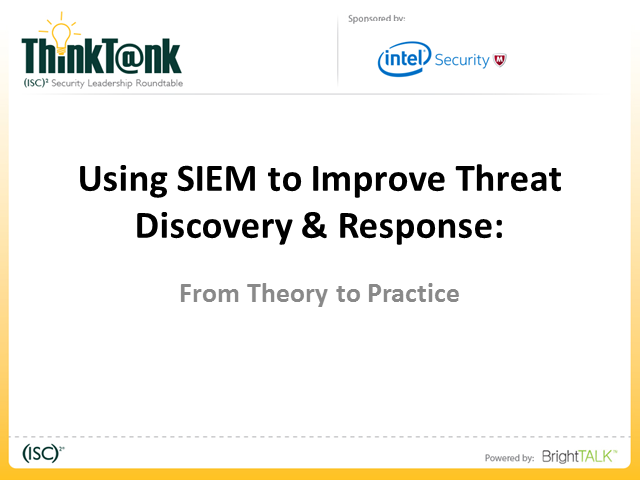 Join (ISC)2 and Intel Security at 1:00PM on March 19, 2015 as we discuss leveraging SIEM and effective means for improving your discovery and responses to today's emerging threats.